Mountain Time Arts presents FLOW, a large-scale video installation by artist Mary Ellen Strom. 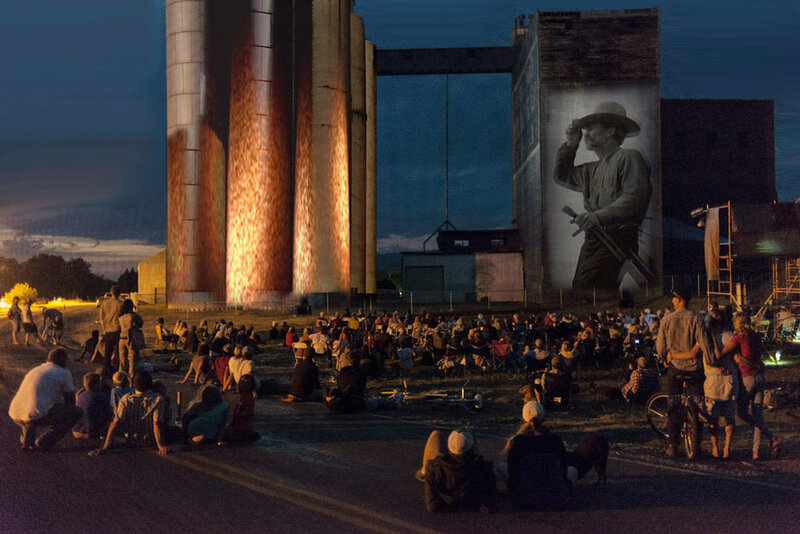 Using video projection, the artist transformed the exterior of the historic Story Mill grain terminal. The Story Mill is a late nineteenth century industrial development that played a significant role in the region’s agricultural evolution. From deep geological time to the present moment, the Story Mill site presents a rich and complex location rife with historic narratives and environmental lessons. Strom’s video projections activated the location’s history (past and present) by enveloping the site’s structures in moving images. Mary Ellen Strom's installations and site-specific projects unearth submerged narratives within art, history and cultural discourse. Her work has been exhibited in a wide range of contexts including museums, galleries, passenger trains, large-scale video projections onto industrial sites and mountain rock faces, in empty retail stores and horse arenas. The Story Mill is an iconic structure located in northeast Bozeman. 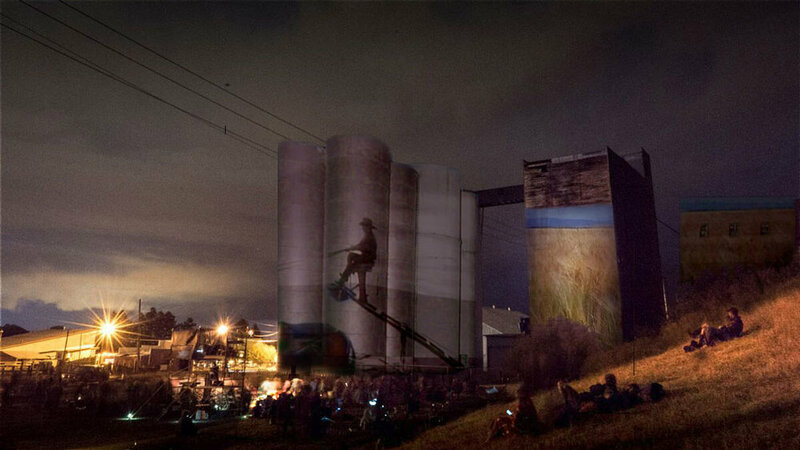 The mill’s towering grain elevators act as a symbol for the complex history of this region. Archeologists have found evidence that water and fertile soil attracted humans to this area we now call the Gallatin Valley for over 5,000 years. The valley provided abundant seasonal hunting and gathering grounds for thousands of years. The indigenous tribal groups that frequented this region were forcibly removed in the 1800s, but survived and still live in Montana today. Since the mid-19th century, these valuable resources of water and soil provided a site for agricultural production and industrial development. Early irrigation systems were collectively dug by newly arrived farmers to the Gallatin Valley in the 1860s. Successful wheat production in the region required large-scale storage and milling. Construction of the massive Story Mill, named after its developer Nelson Story, began in the summer of 1882. A two- mile canal system was excavated that delivered water to power Story’s immense grain milling complex. The Story Mill continued to be powered by water until 1956. In 1883 the Northern Pacific Railway constructed a 440’ long spur track that connected the high-volume Story Mill to the NP’s transcontinental line. The Story Mill Spur now functions as a bike and pedestrian trail. The Story Mill ceased operation in the 1960’s. William Wycoff and Richard Charlesworth.